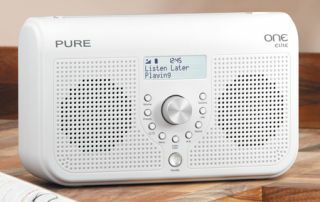 New Pure One Elite Series II DAB radio gets 'listen later' mode | What Hi-Fi? The Pure One Elite Series II is the second DAB radio in Pure's range to get its 'listen later' functionality, which allows users to save a favourite programme (daily or weekly) and listen to it, err later. Priced at £85, the unit is based on the Award-winning Pure One Elite and has both DAB and FM stereo tuners. It's available in black or white. The 'listen later' mode also allows listeners to pause the programme at any time, and automatic bookmarking means that if their listening is interrupted, they can start again where they left off. Additional features include bass and treble controls, a tone or radio alarm with sleep timer, kitchen timer, and pause and rewind of live digital radio broadcasts. There's also an input for connecting an iPod or MP3 player. An optional rechargeable ChargePAK battery (£35) gives up to 28 hours listening without the radio being connected to the mains.